I've created a Google sheet to allow you to track water consumption by capturing your water meter reading from the meter directly or from your bill (or both). Make a copy, and save it to your google account and start capturing. You could also maybe save it as Excel (though I haven't tested that). The spreadsheet has 3 columns to fill in. The template has some dummy data. The first column is the date (and if you wish the time) you took the meter reading. The next is the actual meter reading. The next is the number of people that were in your house since the previous meter reading. If you are adding a row simply select the last row and copy it down and update the values. 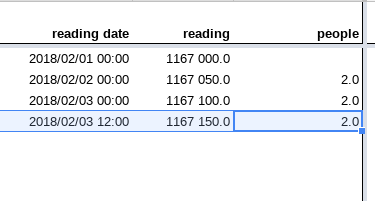 Results appear on the columns on the right showing consumption since the last reading. It measure days, person days and consumption. It also measure total consumption per day and per person per day (p.p.p.d.). If you enter times for meter readings you will see days and person days that are parts of a day potentially. days = Number of days between last meter reading and this one. person-days = Number of days multiplied by number of persons. consumption = Number of litres of water consumed since previous reading. per person per day (p.p.p.d.) = rate per person per day at which you consumed water (consumption divided by person-days). On other sheets consumption is also shown per week (given arbitrary week numbers) per month and per year as shown above. This is automatically updated as you type in values on the data sheet. Some of these only make sense if you take readings in that period. I.e. if you only take readings once a month the weekly figures are likely to be all over the place (though in total they'd still be right). Fill in the litres (not kilo litres). If it's easily accessible just read it yourself and capture the date you read it and the value in the spreadsheet. Should be a good check on the City to make sure they are reading it right. Hope it helps, and share you results! Thanks, I looked for an app. I guess I used the wrong search terms.